You may already be aware that I am a big fan of switching up my skincare routine on a regular basis and constantly trying out new products. Not only do I get bored super easily, but I truly enjoy trying out new brands and hoping that my skin will benefit from each product that I try out. Today I am back with a few more skincare products on trial, which I've tried for a a little while now so I am definitely ready to share my first impressions. 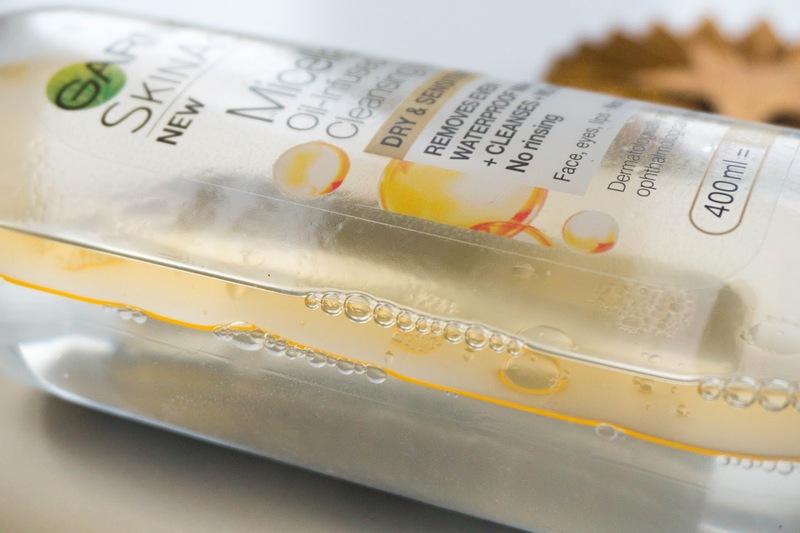 So overall I've got a newbie from my all time favourite Garnier Micellar Water, along with two brands that are completely new to me... Ole Henriksen and Trilogy. Let me just tell you that I have been impressed with all three brands from the first few uses, so today I've got positive vibes all around. 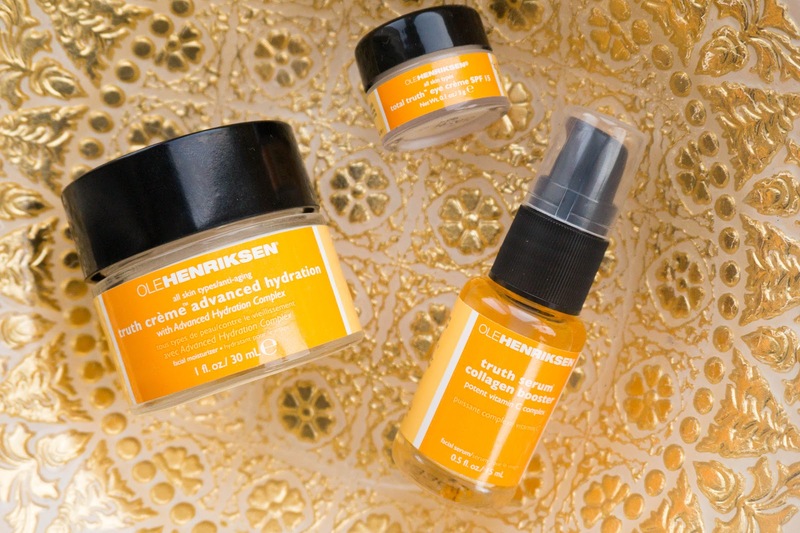 I couldn't be happier that I finally got my hands on a few skincare products from Ole Henriksen, it's just one of those brands that has been on my radar for longer than I care to admit, but only had the opportunity to try them out now. You may remember in my last skincare post that I recently ordered a few bits from feelunique (desperate to use a voucher I received as a gift), so along with the U Radiant Skin Box (full detailed review here) I also got my hands on the Ole Henriksen The Whole Truth Kit £45. Eager to get that perfect glow to my skin for the warmer months ahead, I started using the set as soon as it was delivered to me and I have to say that so far it hasn't disappointed. I use all three products included as part of my morning skincare routine and my skin not only looks great but feels amazing too. 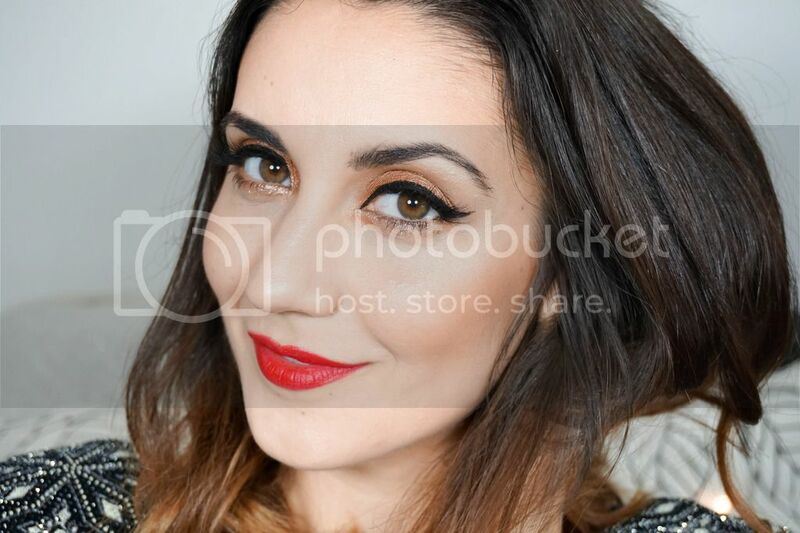 Firstly I apply the Total Truth Eye Creme, which applies effortlessly on my under eye area and doesn't feel too greasy, so there's no need to worry about applying makeup on top of it. Then I will use 2/3 pumps of the Truth Serum Collagen Booster all over my skin and this again is absorbed immediately into my skin, not to mention that it smells incredible (I can definitely see why it's one of the brand's bestselling products). Last step is applying Truth Creme Advanced Hydration, which is the perfectly balanced day moisturiser as it nourishes my dehydrated skin so well and adds a healthy glow. The brand claim that this set will not only keep your skin hydrated and radiant, but also support healthy collagen which in turn will reduce the look of fine lines and wrinkles. I can't comment on this claim just yet as I have only been using the set for 2 weeks and I'm not exactly concerned with wrinkles. It does however leave my skin nourished, brighter and protected, which I am extremely happy with overall. 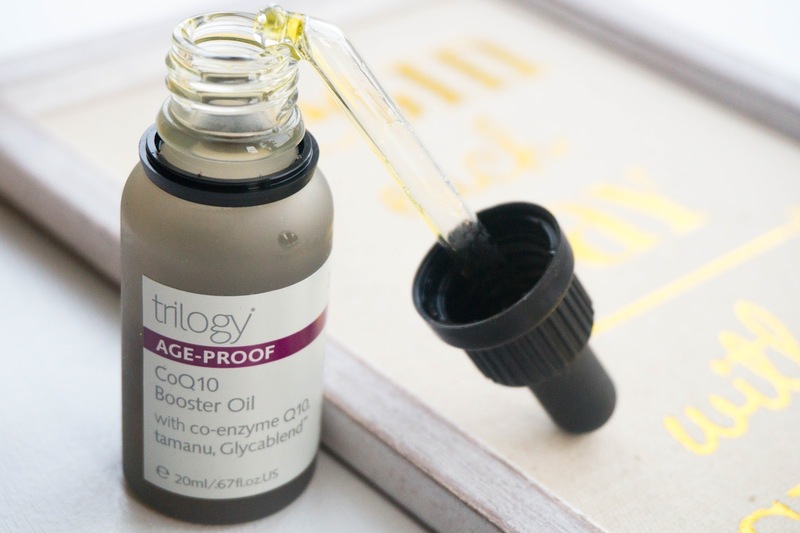 Next up I've got the Trilogy CoQ10 Booster Oil* £29.50, which is part of the brand's newest Age Proof range. The whole range contains the latest Glycablend innovation... a blend of chia, blueberry, strawberry and pomegranate oils, to keep skin supple & youthful. As the name suggests this organic oil contains CoQ10 which is a naturally occurring substance found in cells. This main ingredient helps to boost collagen and elastin production, whilst helping the skin recover. 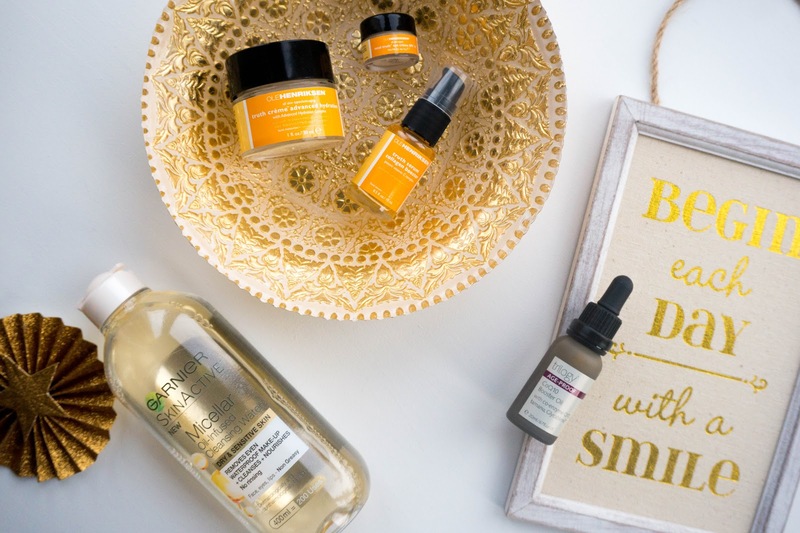 You may already know that I absolutely adore using facial oils as part of my evening skincare routine, so this has been a fantastic addition. Since its quite rich in texture you only need to massage 2/3 drops into the skin and it will leave your face feeling silky soft. Including this in my nightly routine for the past month, means that in the morning I wake up with nourished and revitalised skin. 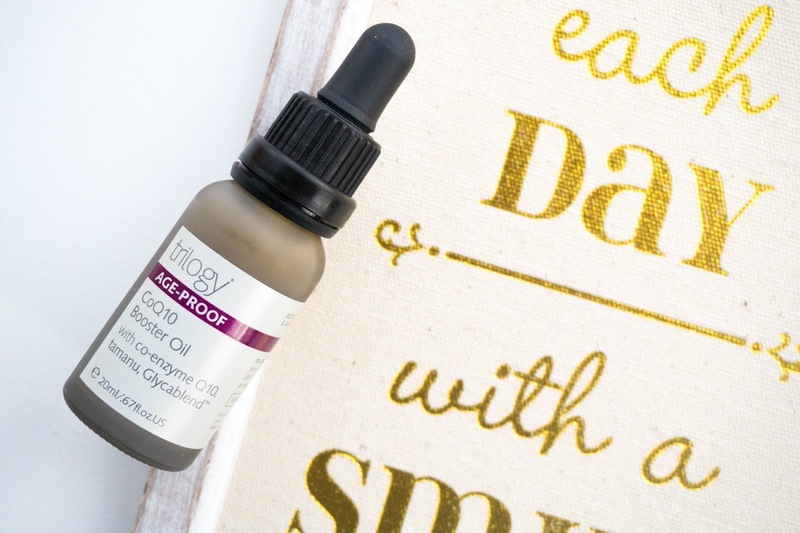 Facial oils in general have become quite an addictive product in my routine and this option from Trilogy is no exception. For 20ml it is a bit on the pricier side but I do feel like it's worth it, since it delivers great results. Oh and to top it all off, it has a lovely light scent to it so my fussy nose is happy also. Last but least I've got the new Garnier Micellar Oil Infused Cleansing Water £5.99, which I spotted in Boots a few weeks ago and picked up within seconds of seeing the last bottle on the shelf. 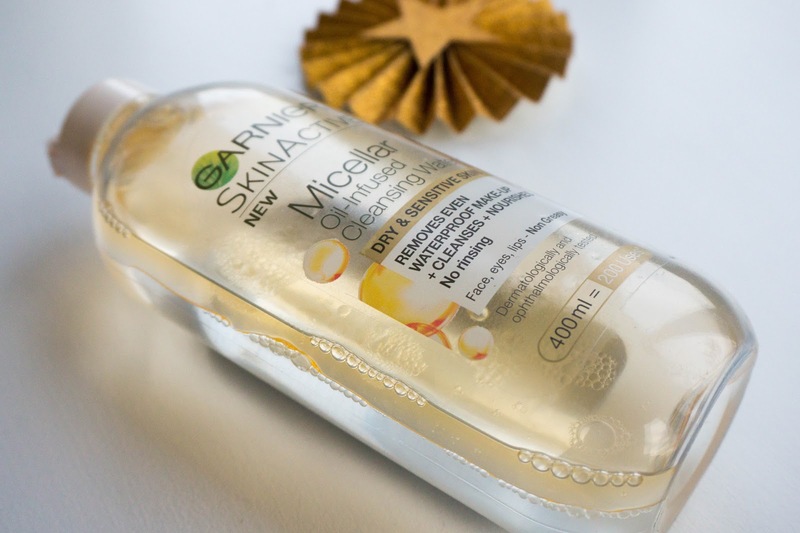 I didn't even realise Garnier we're releasing this new version of their much loved Micellar Water, so when I saw it in Boots I was very excited. I already love the original pink bottle of the brand's Micellar Water, it's been a staple in my skincare routine ever since it was released and I have to say I love this new oil infused version even better. I would imagine anyone with dry/sensitive skin types would love it also, as it's more gentle on the skin than the original yet it still removes makeup perfectly. Seeing the oil at the top of the bottle made me worry about my skin feeling greasy, but it doesn't feel oily at all. I use this as my first cleansing step, basically to take off my eye makeup and quickly swipe off most of my face makeup too. It does an amazing job at removing every trace of makeup effortlessly and I'm never suffering from the panda eye effect. If you're looking to try this new version, the original or the purifying one for combination skin, keep an eye out for regular offers in your local drugstores.